One of the priorities of the NRSC is to encourage the purchase of safe vehicles. Today, thanks to dramatic advances in technology, it’s possible to find many a vehicle with a modern design and powerful engine. Of course, aesthetics and performance are important factors when choosing a car. However, unfortunately most drivers are influenced purely by these factors, forgetting the most important one, SAFETY. One of the priorities of the NRSC is to encourage the purchase of safe vehicles. Since March, the NRSC, through its monthly magazine “Khchughy”, has been providing its readers with a realistic, independent assessment of the safety performance of the most popular cars sold in Armenia and Europe today. The assessment is made by Euro NCAP, established in 1997 and now backed by five European Governments, the European Commission, and motoring and consumer organisations in every EU country. Euro NCAP has rapidly become a catalyst for encouraging significant safety improvements to new car design. Today, more than ever before, safety sells cars. For car buyers it is a key element of their purchasing decision. It’s essential that motoring consumers can obtain reliable and accurate comparative information regarding the safety performance of individual car models. By law, all new car models must pass certain safety tests before they are sold. But legislation provides a minimum statutory standard of safety for new cars, it is the aim of Euro NCAP to encourage manufacturers to exceed these minimum requirements. This section of the site contains an explanation of how Euro NCAP’s different crash tests are performed and how our safety ratings are reached. Frontal impact test is based on that developed by European Enhanced Vehicle-safety Committee as basis for legislation, but impact speed has been increased by 8 km/h. Frontal impact takes place at 64kph (40mph), car strikes deformable barrier that is offset. Readings taken from dummies are used to assess protection given to adult front occupants. Impact takes place at 50kph (30mph). 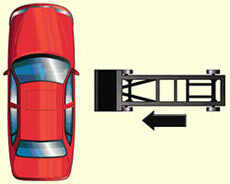 Trolley fitted with a deformable front is towed into the driver’s side of the car to simulate a side-on crash. Readings taken from dummy are used to assess the protection provided for the driver. A series of tests are carried out to replicate accidents involving child and adult pedestrians where impacts occur at 40kph (25mph). Impact sites are then assessed and rated fair, weak and poor. 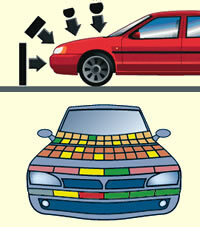 As with other tests, these are based on European Enhanced Vehicle-safety Committee guidelines.